Making schnitzel was a first for me, well kind of. I've helped make schnitzel with my mum when I was little - topping up the bowls of breadcrumbs and flour, beating another egg when needed. But I've never the made the whole thing from scratch. It's a process that's for sure, but well worth it. This particular recipe comes straight from Donna Hay's website. The key to a great schnitzel is using fresh breadcrumbs! Fresh breadcrumbs means you have a mixture of little and big chunks, and the big chunks fry crispy and golden and delicious. 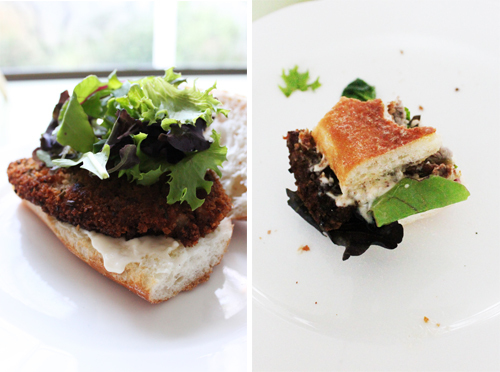 I originally planned to make the schnitzel and eat with a nice salad, but then the idea grew into a fresh ciabatta roll with mixed lettuce and aioli. Yum! You can pretty much add whatever ingredients you like to the roll, but less is more. This recipe ended up making 12 mixed sized schnitzels (they were oddly shaped so I cut them into normal sizes), to which I cooked a few and froze the rest. This is one of the main reasons it's worth making - because you can freeze them for up to three months and cook when you feel like. A very fast and easy meal! Place the breadcrumbs, chives, lemon rind, salt and pepper in a bowl and mix well to combine. Dust the veal in flour, dip in the egg and press into the crumb mixture. To freeze, layer the schnitzels between sheets of non-stick baking paper in an airtight container and freeze for up to 3 months. Before cooking, place the schnitzels in the fridge and allow to defrost completely. To cook, heat 1cm of oil in a large frying pan over high heat. Cook the schnitzels for 1 minute each side or until golden and crisp. Drain well on absorbent paper. Makes 8.